Since most defensive rounds come in 25 round boxes, my personal testing is based on 2 boxes. You may agree or disagree, feel free. I consider the cost cheap considering what I am protecting. First I want to see if the gun and ammo combination is controllable, or how bad recoil is. From 21 foot I shoot 3 rounds using both hands, mark the target and then shoot 3 rounds strong hand, check the target and repeat with 3 weak hand. Was I able to control the shots / weapon for decent accuracy. I am not going fast nor slow when doing this I am shooting, getting back on target for “combat accuracy” (for me that is thoracic hits) and firing again. If all functions and I feel I can control the handgun / ammo combination, it is time to move to the next steps. If not, I move to the next ammo test or wrap this one up if it is the only one I am testing. My second test is the “Bill drill” on paper at 21 foot. 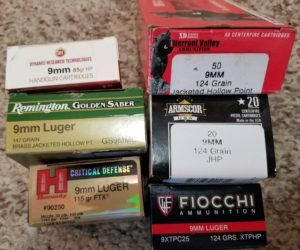 I run a timer, that way I have a baseline for the ammo and can compare it to any other ammo, defensive or plinking in terms of speed and accuracy. I prefer the Bill drill because it truly test the speed with which I can run the gun and if that ammo can keep up (feed, extract and lock the slide back). I load 2 magazines with 6 rounds each. Run the first drill. I then ask myself, did the weapon function, did the slide lock back and was I (not the ammo at this time) accurate. Depending on the targets you use, you should go for all thoracic cavity or USPDA “A” zone or IDPA “down zero” hits. Next magazine I step back to 30 foot and repeat the drill. Did the weapon function? Did the rounds chamber? Eject and lock the slide back on the last round? Was I decently accurate? If all ammo fed, ejected and locked the slide back, time to move on. If not I try to figure out why. If it is not a quick diagnostic, the ammo / gun combination is dropped. Now it is time for some accuracy testing. Here I load up a magazine as full as it can go. Each time I am aiming at a different target or place on a target so I know which group is which. From a bench with a rest of some sort, a sand bag, whatever I have at the range, at 10 yards I shoot 3 rounds, slow and controlled. We are going for accuracy and slide lock, nothing else. How “tight” was the group? Next I evaluate where my point of hold (POH) was compared to the point of impact (POI). At this distance they better be less than 2”. If it is larger, can my sights be adjusted that much? If not, the ammo is either dropped or I make a note that I need different sights. I had a Beretta Tomcat in .32 ACP. It shot about 7” left and up with all ammo at 10 yards, when I moved in to 15 foot, it was still way up and left. That firearm was sold. Yes, I did disclose to the buyer how it shot for me. I then repeat at 50 foot, how big is that group? Would the gun and ammo combination be able to neutralize a hostage taker with accuracy? Where was POI compared to POH? Again if this is too great I may have to consider dropping the load. Then I go to 25 yards, how tight is that group, what would I trust it to do? If the group is over 4” the ammo is no longer considered for me to use with that gun. I also factor in the POI vs POH. I did not start doing this until I started leading a church security team and watched a lot of gunfights in churches, malls, bigger areas. It turned out there were enough reason’s that I added it to my test. Then one last time I go out to 50 yards. The group must be no bigger than 8” and impact at POH. Yes that is big and in theory all ammo should be able to do this, but every pistol and round has a different combination. At 50 yards, standing, both hands on the weapon, I take 3 shots at the target, aiming as best I can for the thoracic cavity. Did that work? If so Repeat. Work again? How do my hands feel? While I hope to never be in a pistol firefight and really hope I don’t have to shoot 39 rounds, I need to know, am I fatigued and if my hands are sore or achy. If so, this may not be the round for me, even if all other things passed. Yes, I can and do shoot hundreds of rounds in practice and training in a day, however those are practice or target loads, not full power defensive loads, there is a difference. If the ammo only came in in 20 round boxes I load it, holster then, on the clock shoot to the head, as fast as I can while staying accurate. Timed of course. With the remaining ammunition, I move back to 10 yards, get out my timer again and load magazines with 2 rounds each. I shoot 2, reload and shoot 2 on the clock. I then repeat the drill. This drill has the purpose of seeing how well things go during a “speed” reload. Believe it or not, I have found sometimes I feel all else is good but when I reload “on the clock” I find that I am having trouble with recoil and or accuracy and or reloading (due to recoil). If I cannot get the weapon reloaded, back on target, accurately and quickly, then I need to try other defensive rounds. Now it is time for a timed run of the Mozambique drill just to get the extra confidence in myself, the pistol and ammo combination. I also time this for my records. If this is the only round I am testing, all is done, if I am testing several different loads, I will repeat the above process. 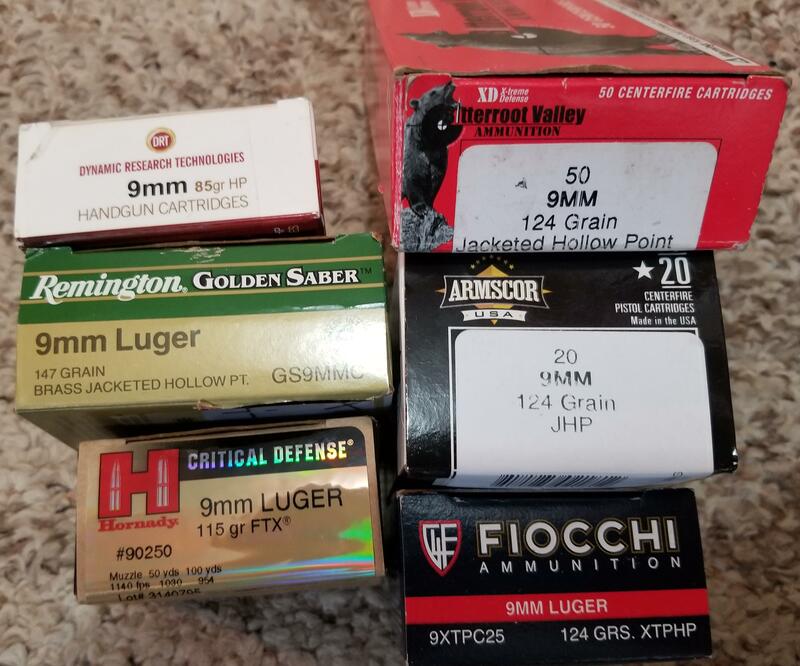 I wrap up by checking my notes and comparing the new test round(s) with any previous test defensive ammunition I have run through that pistol. The one that fills my needs the best, gets loaded into the gun and my spare magazines. I have a separate journal for each weapon on each defensive load tested, as well as other shooting data. If I forget why I have 147gr Remington Golden Sabre, 115 Gr Hornady Critical Defense and the 85 Grain DRT ammo, I can look at my notes and see which shoots “best” in which gun. I currently carry the 147 grain Golden Sabre’s in my primary CCW pistol, a Gen 2 Glock 19. I used to carry the 124 grain Golden Sabre, via testing I found the 147 slightly more accurate and no more or less recoil. I use the 85 grain Dynamic Research Technologies in my BUG, a Glock 43. The Golden Sabre’s, as well as others I tested, just provided too much recoil in the little G43.